Music legend Aretha Franklin divided social media with her nearly five-minute long gospel-tinged performance of the "Star-Spangled Banner." 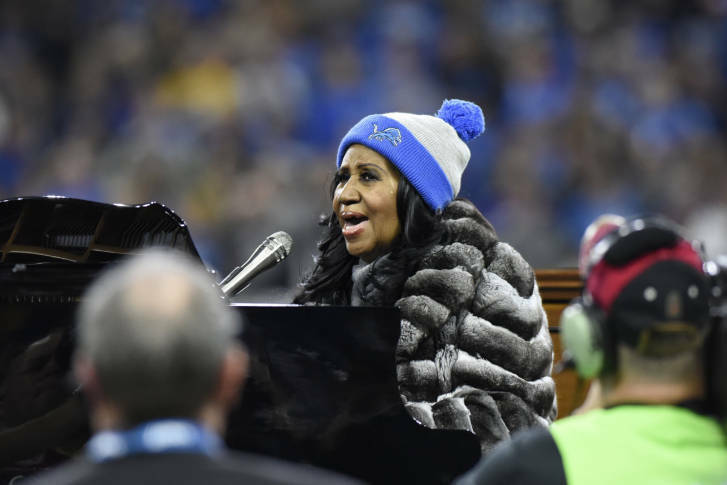 WASHINGTON — Music legend Aretha Franklin took her time during a performance of the national anthem before a Thanksgiving Day game between the Detroit Lions and Minnesota Vikings. Accompanying herself on a grand piano inside Detroit’s Ford Field, the Queen of Soul stretched the “Star-Spangled Banner” into a nearly five-minute-long gospel tour-de-force, complete with rolling piano arpeggios and the divas’s famously throaty vocals. Franklin’s extended version sparked a mixed reaction on social media. Some called it the best rendition they’d ever heard. The remarkable national treasure Aretha Franklin sings the best version of the national anthem EVER! Others poked fun at Franklin’s lengthy rendition of the famous tune. The Detroit native has won 18 Grammys in a career spanning more than 56 years. Some said the singing legend had earned the right to take it slow. See more reactions to Franklin’s performance. The Lions beat the Vikings 16-13.